PIAB, the global leader in vacuum technology, recommends its latest P6010 vacuum pump and sets new milestones in vacuum technology. 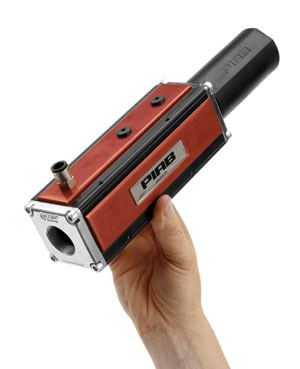 Based on PIAB's patented COAXÂ® multi-stage vacuum technology, the P6010 can provide 40% more vacuum flow than conventional vacuum pumps while saving energy consumption. The rugged, reliable, maintenance-free design makes the P6010 ideal for automated object handling and other processes in the automotive, robotics, printing and packaging industries. Thanks to its PIAB patented COAX technology, the P6010 can generate a powerful vacuum suction without producing any heat at a very low compressed air pressure. In addition, because of its compact size, it can be installed closer to the suction position, which also reduces the amount of gas and energy consumption. The modular design of the P6010 has a frame size of 77 x 73 x 214 mm, making it easy to install the pumps together between pumps. The P6010 and its accessories are also flexible and easy to install and fix. This vacuum pump body is made of anodized aluminum and can withstand the rigorous industrial environment requirements, while the safety factor of the entire pump reaches IP65. Depending on the operating conditions, customers can choose one of the following P6010 control integrations to effectively increase productivity: PIAB Automatic Vacuum Lockdown (PCCTM), and Automatic Vacuum Management (AVMTM). Both PCCTM and AVMTM provide vacuum induction and save energy. PCCTM has many advantages when dealing with porous leaky materials such as paper and corrugated cardboard, while AVMTM is more suitable for non-leakage handling of objects such as steel plates, plastic plates or glass. Designed specifically for object handling in the printing and packaging industry, PCCTM automatically maintains a preset vacuum to ensure a consistent and reliable vacuum at the point of suction. The benefits and reliability of PIAB-PCCTM are even more pronounced when the degree of vacuum fluctuates due to frequent changes in the items being handled and the duty cycle changes. Because PCCTM eliminates the risk of dropped objects. In addition, because PCCTM reduces compressed air consumption (pressure and air consumption), it also reduces the noise of the entire vacuum system. This ensures that the system operates at the optimum vacuum level. It also reduces wear on machine parts and reduces the use of spare parts and maintenance. The AVMTM has increased efficiency for manufacturers in the automotive and robot industries because when the set vacuum is reached, it automatically shuts off the air supply, which saves energy while maintaining suction. With efficient blowers that quickly equalize differential pressure and reduce cycle time, AVMTM can save up to 90% in compressed air consumption compared to conventional continuously operating vacuum systems. Both PCCTM and AVMTM are integrated, and all types of valves and vacuum switches are included inside. In this way, customers do not need to spend time to design and add control and monitoring devices, as long as they can connect directly. Guest Towels : mean for Home Use , Home Use Towel not like normal guest towels , our guest towels quality could meet Hotel Towel quality standards , Its Advantage is good washing , long time washing and color fastness could reach 3.0 grade , not like normal Guest Towel , quality is cheap . Our factory has 150 workers and we have different workshop for making towels , bathrobes , slippers and Bed Sets .